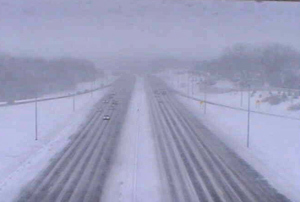 View from DOT camera on I-235 in Des Moines. Twenty-eight counties in north-central, northeastern, central and south-central Iowa are under a Winter Storm Warning until tomorrow night, while most other areas except for southwestern Iowa are underneath a Winter Weather Advisory. Brad Small, a meteorologist with the National Weather Service says snowfall totals will build throughout the day. He says snow amounts in northeastern and north-central Iowa in the eight to 10 inch range, with the snow coming in a long duration in differing intensities. Blowing snow will become an issue during the day on Tuesday. Small says road crews will have to work throughout the day today to keep the roads clear. He says travel will become increasingly difficult throughout the day, and then when the winds pick up tomorrow it will be an issue with rural roads likely blowing closed. Small says conditions probably won’t improve until Wednesday morning. Small says winds will diminish a little bit Tuesday night, but won’t lighten up until daybreak on Wednesday. He says the worst blowing will be during the day Tuesday. Small says there’s no snow in the forecast after tomorrow, but it will be cold. He says lows will be in the single digits Wednesday evening and then will moderate a little toward the weekend. Small says with moisture in this round of snow, it adds to the already increased concerns for moderate to major flooding this spring once the snow melts.